Johann Zoffany was a German artist by origin but he worked in England where he achieved success with his “conversation pieces” and theatrical compositions. Trained in the Rococo style, Zoffany began his studies in Ratisbon with the artist Martin Speer and focused on history painting. In 1750 he is documented in Rome in the studio of Agostino Masucci. His early works, such as those now in the Musée des Beaux-Arts in Bordeaux, are mythological compositions that deploy a highly detailed style and a precise technique that were appreciated at the time. In 1767 the artist decided to move to England to further his career, arriving that summer and entering the studio of Benjamin West as a drapery painter. His brief period in West’s studio would be important for Zoffany as there he met the famous actor David Garrick who appreciated the young artist’s abilities and promoted him professionally. Also at this period Zoffany evolved a new type of subject matter that would be extremely successful in the 1760s in the form of paintings of theatrical episodes. Garrick’s influence has been seen to lie behind the development of this essentially modern subject matter, which depicted real actors portrayed in the characterisation and costumes of their famous roles. The great actor David Garrick (1717–1779) grasped the potential of prints based on paintings of this type, which would reach a large public and hence promote his activities. 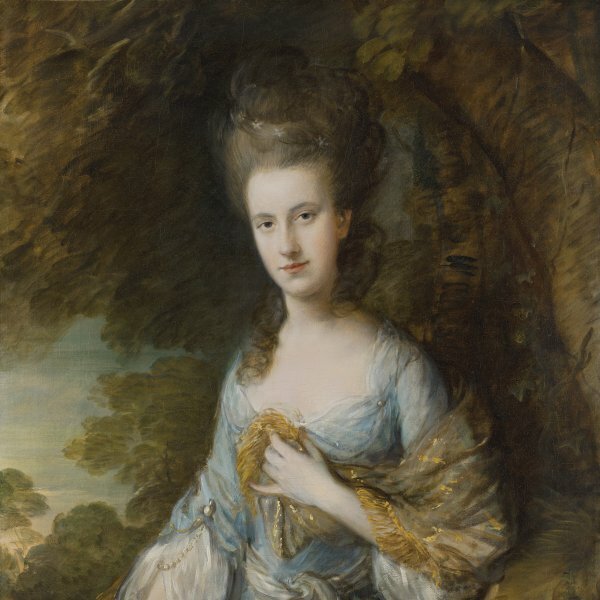 The present sitter has been tentatively identified as the actress and singer Ann Brown (1748–1784) in the role of Miranda in The Tempest. This identification appeared in the entry on the painting when it was included in an exhibition on Zoffany held in London in 1977. Ann Brown had worked for Garrick’s company between 1769 and 1770 then continued her career at Covent Garden between 1772 and 1776. After her marriage, when she became Mrs Cargill, she embarked on a tour of India and was shipwrecked and drowned in 1784 on the voyage back to Britain. Zoffany depicts his model in a romantic setting that may be a theatrical backdrop. The dark interior of a grotto in which the actress is located is illuminated by a powerful beam of light that falls on the figure and the rocks on which she leans. With her body presented frontally and her face turned to our right, she looks at the viewer while scratching a heart on the rock face behind her with a point. The actress wears a rich gown with a low neckline in shades of silver and salmon pink and has a brooch with the image of a man on her left shoulder. The cloth of her dress and mantle reveal Zoffany’s characteristic realism and taste for detail and he brilliantly reproduces the textures of the gleaming satin, the gauzy veil over her hair and the pearls that adorn her head and bust. 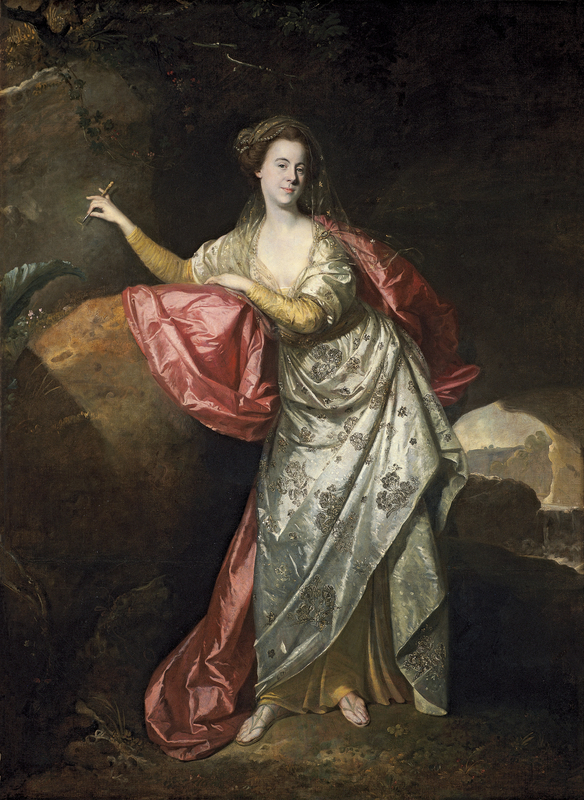 The canvas has been dated to around 1770 on the basis of its technical similarity to the portrait of Mrs Woodhull in the National Portrait Gallery London. The canvas and its frame entered the Thyssen-Bornemisza collection in 1977 from the collection of the Marquis de Lastic in Paris.